If you choose to use canned beans, skip this step and go on to the next one. Soften the dried beans, wash and cook over medium heat in a large pot in 1 1/2 liter of water with 1 teaspoon salt, garlic, cumin and bay leaf. Simmer until they are soft (about 1 hour), check on the water occasionally. Add 1/2 cup of olive oil to a pot and fry the rice for a few minutes, then add the beans, make sure to use only 5-6 cups of water in which the beans were cooked. Cook over medium heat – keep covered until the rice has absorbed the liquid, about 20 minutes. Heat oil in a large skillet and add onions, peppers and cook for about 2 minutes just to minimize them a bit. Once ready, pour it over the cooked rice and mix well. Garnish with 1 red pepper cut into strips and pour the liquid over the rice. You can add pieces of cooked bacon. Remember to soak the beans for one hour if you’re using dry beans. 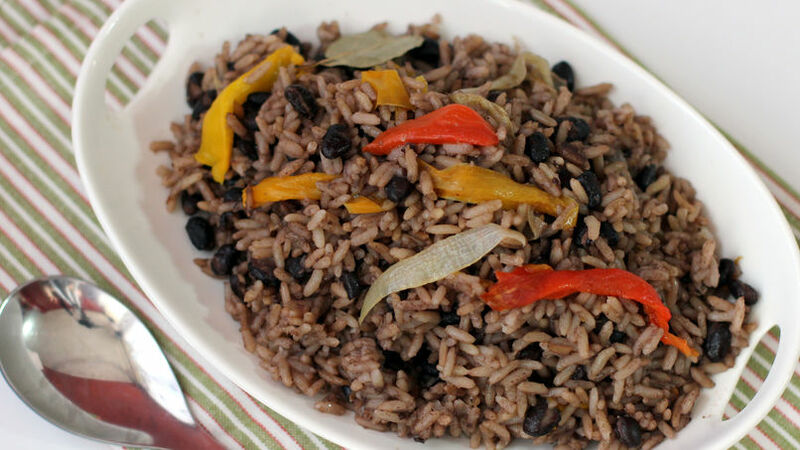 Congrí (moros y cristianos as they’re also known) is a very popular dish in Cuba made up of rice with black or red beans. Its preparation has its tricky parts, but the trick to getting the rice to be nice and dark is simple. I was lucky enough to learn this from one of my Cuban friends and since then I have followed her instructions to the letter, while still adding my own personal touch.